Best Plumbing Company – Readers’ Choice Best of the Big O! Our roots began in South Omaha when Bob Eyman launched Eyman Plumbing in 1957 as a one-man shop. With his son Bob Jr. and wife Anne, and then his three grandsons – Tom, Tim and Terry — the business was built based on trust, hard work and fair prices, starting with working class homes and South Omaha’s industrial base in meatpacking. Known as the “fix-it” company, Eyman gets the calls to fix the toughest problems, even from our competitors, because of our experience, reliability and service. That also means we’re available 24 hours, 7 days a week, 365 days a year. 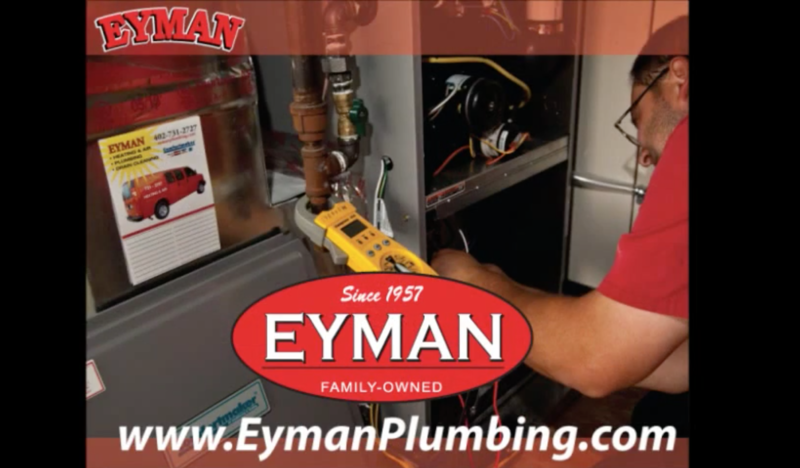 Eyman Plumbing Heating & Air’s mission is to be the preferred provider of commercial, industrial and residential mechanical system services. Our goal is to exceed our customer’s expectation with superior employee expertise, quality products and technological innovation — providing our customers timely, cost-effective solutions to their unique challenges. “There is not a team member at Eyman that doesn’t feel the responsibility that comes with the word we lead with — Trust,” says CEO Tom Eyman. Eyman has a simple standard that anchors 4 generations of service – what would you do if the work was at your family’s house or business? We will clearly explain what services we recommend and why, and stay in communication with you until the job is done to your satisfaction. We pride ourselves on staying up-to-date on services and products to bring you the most comprehensive care possible. We wouldn’t invite anyone into your home we wouldn’t invite into our own. After taking every measure possible to ensure our customers are always satisfied, we go all the way, fully bonding and insuring our team and warranting their work. Warrantied: We offer a 1-year warranty on parts and labor for every job we do on top of manufacturer product warranties. Insured: We have complete and thorough coverage for every contingency. Bonded: Bonding insures your job is completed with all the proper permits by technicians with the highest levels of certification and licensing. These guarantee our customers’ peace of mind that their Eyman work is completely covered. Broken Plumbing and HVAC is a Headache, We Won’t Be! By the time you’ve called us, you might already be dealing with a mess. We work to ensure that we are not contributing to it! As good home mechanics, we will be responsive, courteous and we strive to leave the work area nicer than we found it. We train our technicians to fix problems wherever possible. We’re not there to sell you anything and our technicians are not commission based. We will explain your options, and with your approval, fix the problem quickly. Only if service is impossible or not worth the investment, will we recommend replacement. We will discuss all services and fees before they are performed, so you will find no surprises on your bill. We seek the best prices on the highest quality products to provide you with the safest and most reliable service available. 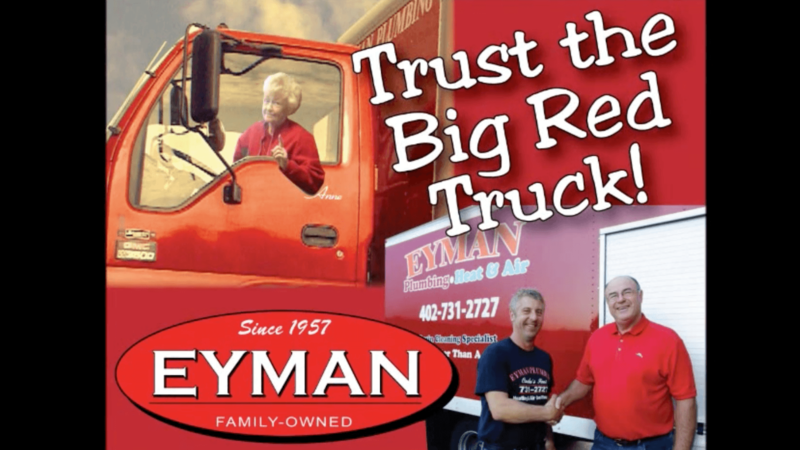 Know you can TRUST THE BIG RED TRUCK! Eyman means trust, and we will stay with you until your system is functioning properly. We want you to have as much faith in our work as we do. We currently have our 4th generation of Eymans working together. While the projects have become more complex, and Omaha’s aging infrastructure demands tougher solutions, one thing hasn’t changed. We’re still family-owned and just like great-grandpa, we strongly believe in trust, hard work and fair prices.